Since we opened our doors in 1990, we have been Steamboat's largest full service bookstore and the locals' favorite meeting place for Good Books, Good Coffee and Good Friends. Who are we? Real people who read books and admire great writing. We stand ready to help you find your next great read. 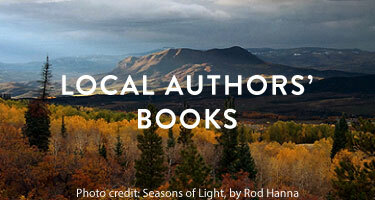 Check out our recommendations – good reads from our staff and friends. What about our store? We are a full service, independent bookstore, with extensive collections of current literature, fiction, history, memoirs, and young adult books. We feature a large children’s collection, and our famous kids book nook for our youngest readers! We carry the Indie Bound selections, NY Times best sellers, and as a sponsor of the Literary Sojourn (www.literarysojourn.com), a full selection of the Literary Sojourn authors. In addition to our carefully hand selected inventory of books, we stock wonderful greeting cards, games, puzzles, candles, journals, chocolates and a varied assortment of unique gifts. We can help you select the perfect gift, wrap it and even ship it. Our coffeehouse serves the best coffee drinks in town, pastries, iced blended drinks, plus wine and locally handcrafted beer. We are pleased to be serving Steaming Bean coffee, roasted in Telluride, CO. The store, on 9th Street in historic downtown Steamboat Springs, is open 7 days a week.